THE GREAT DONEGAL STORM – WHAT IT LOOKED LIKE FROM SPACE! THIS is what Tuesday’s massive storm looked like – from space. The satellite image was taken by the American space agency NASA. And it shows the eye of that storm as it passed over Malin Head with the ferocity of a hurricane. Makes you realise how big and bad it really was – even though we all managed to escape with a few missing shed roofs and the odd smashed car. 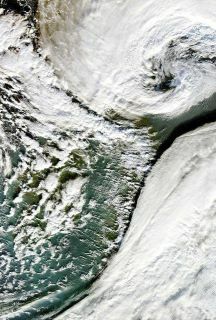 The storm is now causing havoc over northern Europe, ripping through areas of Denmark.